Great American Art Works' has discovered new materials, techniques, and equipment they use to create uniquely excellent pastels. 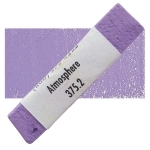 These handmade soft pastels are richly pigmented, and have superb brilliance of tone. Calcium carbonate, the mineral constituent of chalk, is a low tinting strength, inexpensive white pigment that is often used is a buffer and filler. Because of its low tinting strength, it is overwhelmed by other colors. It is used in gesso and other coatings to give the surface more tooth, a desirable characteristic for some painting techniques. Calcium carbonate is completely non-toxic, and is used in many food, cosmetic, and pharmaceutical products. However, excessive consumption is not recommended. Naturally occuring chalk deposits have been mined since prehistoric times. Rocks and minerals that contain calcium carbonate include aragonite, calcite, vaterite, chalk, limestone. marble, and travertine. Calcium carbonate is the principle component of lime, used in many agricultural and industrial applications. ™ Great American is a trademark.